Renee and Siena have decided on a baking party for their birthday in June, so I've already started looking for different ideas–including any decor ideas you can do with cupcake liners. I came across this great little roundup on Babble.com. 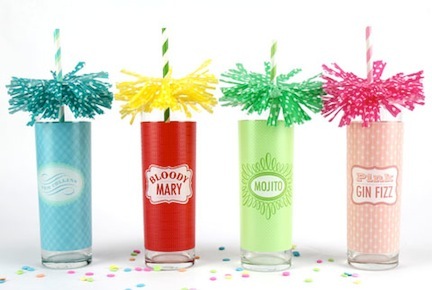 My favorite project is this super fun fringe to dress up your drinks! Not only great for a baking party, but for any occasion where you want to add some pizzazz to your cocktails. So easy. Just fold the cupcake liner into quarters; cut the top to give you the center hole, and cut the fringe. Find complete directions in the original post at Daily Mixer.